Posted bycyclingpassion	 May 25, 2017 Leave a comment on Downhill from Stelvio, in the night, with no hands, no brakes! This is the story of the last record attempt of Giuliano Calore, a racing cyclist, world champion of extreme cycling, holder of 13 records and won 98 medals. He was born in Padova (north-east Italy) in 1938. The movie titled “48 Tornanti di Notte” (48 Hairpin Bends by Night) tells about his most impressive challenge so far: descending from the Stelvio Pass – at an altitude of 2758 m – at night, with all of its 48 hairpin turns, on a bike with no handlebars or brakes, illuminated only by a torch and moonlight. There was a fabulous ice-cream maker in Bologna. From the age of 14, he started riding from Padova to Bologna and back to buy their ice-creams. It was a 240 kilometers (150 miles) round trip. 1981 – up and down the Stelvio, while playing four different musical instruments with a total weight of 33 kg. 1983 – he runs 14 dolomites passes covering 330 km (205 mi) in 13 hours. 1984 – he climbs Stelvio’s 48 hairpin turns in 1 hour and 36 mins, only pedaling with the right leg. 1989 – he climbs the Stelvio in 1 hour and 17 mins, defeating Bernard Hinault’s best time. 1990 – he overcomes snowy Dolomites passes: 321 km (199 mi), temperatures between -17°C and -20°C (this record was made on a bicycle with handlebars). 1991 – he passes through 2520 doors with stakes at a distance of 54 cm. 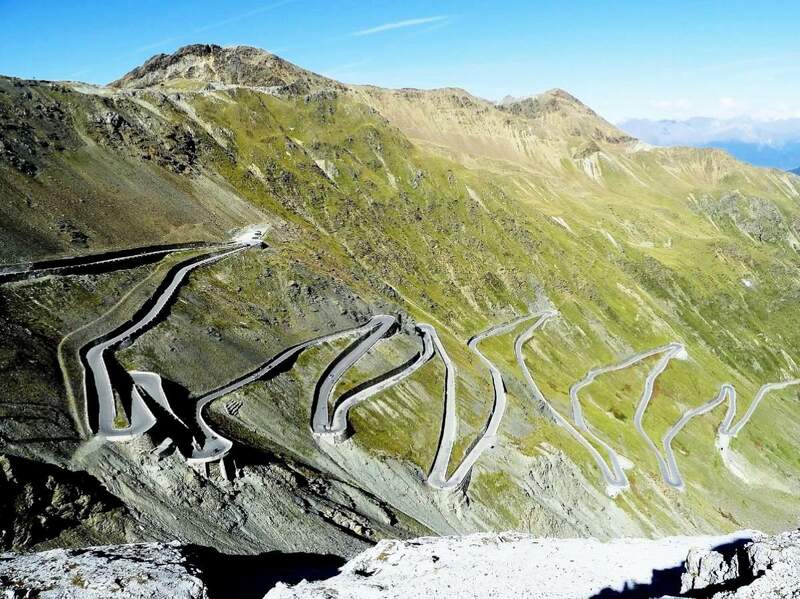 1998 – he descends the Stelvio passing through 228 doors 48 cm wide. 2001 – he challenges an iced track with normal tubular tires, passing through 228 doors just 46 cm wide. “’48 Tornanti di Notte’ tells the incredible story of this extraordinary character, with a boundless passion for cycling and a free, unconventional lifestyle. Here is the video of Calore’s 1986 descent from Passo dello Stelvio with no hands & no brakes. 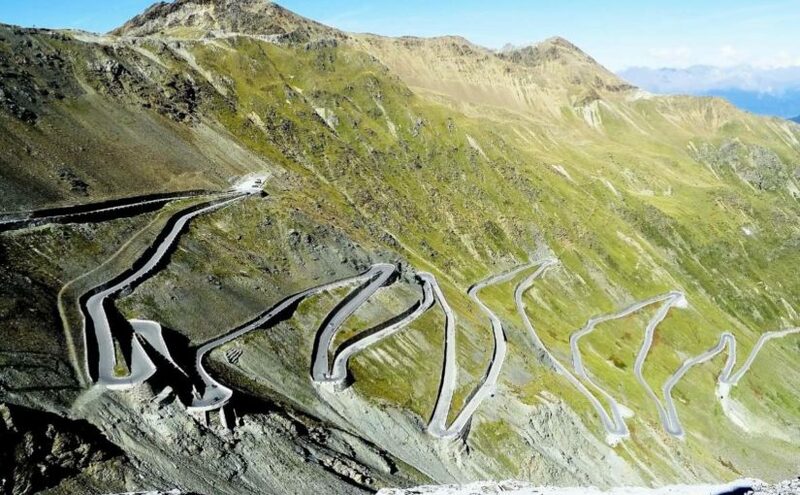 At an elevation of 2,757 m (9,045 ft) above sea level, Passo dello Stelvio (English: the Stelvio Pass) is the highest paved mountain pass in the Eastern Alps, and the second highest in the Alps, just 13 m (43 ft) below France’s Col de l’Iseran (2,770 m /9,088 ft). 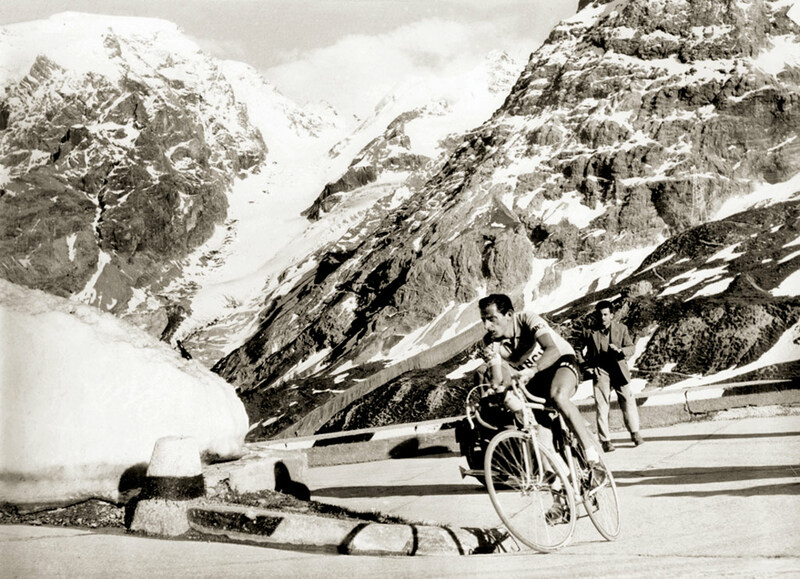 The Stelvio first featured in the Giro d’Italia in 1953, and Fausto Coppi was the first atop it (Coppi also won the stage and the 1953 Giro). It is also the highest point of Cima Coppi, the summit with highest altitude reached by cyclists during the Giro d’Italia, which was established in 1965, five years after the death of the “Il Campionissimo” (champion of champions) Fausto Coppi.